The cultural highlights of Ethiopia’s Historic Circuit combined with three days in the Simien Mountains National Park. Excellent organisation and use of superbly knowledgeable tour guides. It was a well thought out itinerary and as on previous holidays with Mountain Kingdoms, the in-house tour staff were very efficient. The information in the pre trip dossier was very helpful. Kuru our tour leader was efficient, caring & great fun to have around. He had excellent English. All in all, it was a great success! This trip offered a wide variety of sites and experiences. You ended each day feeling that no time had been wasted. We visited a local school, this was an excellent experience and gave us a chance to give something back to the delightful people of Ethiopia - an excellent 'add-on' to a delightful trip. Everything is very well organised. This definitive cultural tour in Ethiopia has been carefully designed to take you to all the most important sights on the historical circuit of Ethiopia and includes three days exploring the Simien Mountains. After a day exploring the thriving, colourful capital city, Addis Ababa, you move on to Lalibela – famous for its breath-taking rock-hewn churches – carved in the 12th and 13th centuries and still thriving as working churches today. After almost two full days here you head north to Axum, the ancient capital of the longstanding Axumite kingdom – one of the oldest African kingdoms. A UNESCO World Heritage site, Axum is one of the most important sites in Africa and is home to many spectacular, towering stelae, underground tombs, and palace ruins. Following a day viewing these 1,800 year old great monoliths, you fly to Gondar. Gondar is often described as Africa’s Camelot and is home to a dozen castles built by the various emperors over the course of 236 years. You will have plenty of time to stroll around the Royal Enclosure – a 70,000 square metre site housing castles from Emperor Fasiladas’ reign in the 17th century. From Gondar you drive to Sankaber to spend two full days exploring in the Simien Mountains. Home to the endemic gelada baboon, Walia Ibex and Simien Fox, the Simien Mountains also boast an abundance of intriguing endemic birds and flora and stunning scenery with dramatic gorges, canyons and escarpments. Exploring on foot, you’ll be able to witness spectacular scenery in the park where you are most likely to spot the endemic wildlife. Walking is at a relaxed pace, so you will have ample opportunity to spot the unique flora and fauna, and chat to village children en route. To complete the circuit you visit Bahir Dar and take a trip to the 328 feet wide Blue Nile Falls, known locally as Tisisat, which means Smoking Water. The water plunges some 150 feet, giving rise to picturesque stream clouds and rainbows. Your next day will be spent on a boat trip over Lake Tana, Ethiopia’s largest lake. There are 37 islands on the lake and 30 of them have churches and monasteries of considerable historical and cultural interest. This day long boat trip visiting monasteries is a very enjoyable and relaxing way to conclude your holiday. Meal arrangements: Bed and breakfast in Addis Ababa plus a farewell dinner on day 13. All meals elsewhere. Fly to Addis Ababa. Half day sightseeing. Fly to Gondar. Sightseeing. Drive to Simien Mountains. 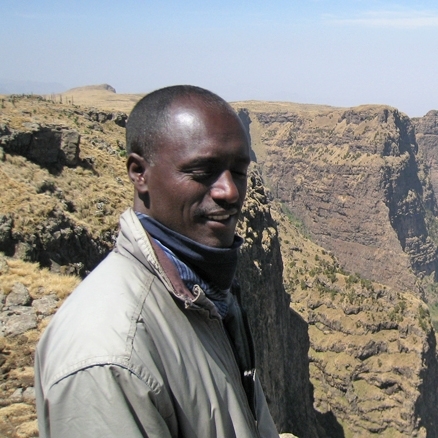 Gentle walks in the Simien Mountains National Park to Sanakber and Bwahit. Drive to Gondar and on to Bahir Dar. Visit Blue Nile Falls and boat cruise on Lake Tana. Fly to Addis Ababa. City tour. Fly back to London. We use English speaking local leaders - they are certified/registered guides, and in their company you will certainly gain an insight into the way of life, traditions and culture of Ethiopia. Depart London for your overnight flight to Addis Ababa. Day 2 - Arrive Addis Ababa, 2,400m/7,874ft. Group transfer to hotel. Sightseeing. You arrive at Addis Ababa in the morning. You will be met at the airport and transferred to your hotel. Following your overnight flight, you may want a shower and snooze. After lunch, you will visit the National Museum, famous for its palaeontology exhibits, the most prominent, important, and memorable of which is 'Lucy', a fossilised bipedal 3.2 million year old hominid. She is famed for being the oldest and most complex hominid found. You will then move onto the Ethnological Museum. This is housed inside the Addis Ababa University and provides a fascinating insight into the diverse cultures of the country. It has some imaginative displays including the music section. It is also likely you will visit St George's Cathedral and Museum where Haile Selassie was crowned in 1930. You may briefly have time to proceed to the clothing co-operative where you can see men weaving their traditional clothes and blankets before selling them in the adjacent market. It is a not-for-profit organisation so prices are very reasonable and fixed. Day 3 - Fly to Lalibela. Sightseeing. You will be taken to the airport for your Ethiopian Airlines flight to Lalibela. The routing is usually via Bahar Dar (one hour) and Gondar (20 minutes) before a further 30 minutes brings you to Lalibela. Your transfer to Mountain View Hotel will be waiting for you. The journey from the airport to the hotel is around 20-30 minutes and you drive through the town before arriving at your hotel which sits in a prime spot on the hillside above the town. Recently built, this is a delightful hotel with plenty of character and charm, which has been designed to maximise its superb location and views. Shortly after you have checked into your room, your tour guide for the day will meet you and take you to see what Lalibela is famous for - its rock-hewn churches. There are 11 churches in total and they date from King Lalibela's reign in the 12th and 13th centuries. Not all the churches are carved into the rock-face, some are free-standing, but all are unique, captivating and are still very much used by priests, locals and pilgrims alike. Many Ethiopians make the pilgrimage here and it is a common sight to see them prostrating themselves both inside and outside the churches. Priests will proudly display their Ethiopian crosses which have many different designs. Devoid of UNESCO's scaffolding and possibly the most memorable of all the churches is Bet Giyorgis - a 15 metre, 3-tiered plinth in the shape of a Greek cross. Day 4 - Sightseeing in Lalibela. Today you will see the remainder of the churches including Bet Amanuel which is freestanding and replicates the style of Aksumite buildings. Day 5 - Fly to Axum. Sightseeing. Today you will fly to Axum. Axum was the capital city of the longstanding Axumite kingdom, one of the most ancient African kingdoms, and represented a vital crossroads between Africa and Asia for almost a thousand years. The ruins still visible in Axum stand as testimony to an exceptionally high level of civilisation, notably the stone monoliths which are dotted throughout the city. These spectacular 1800 year old stelae were carved from single pieces of granite and legend has it that the Ark of the Covenant's celestial powers were harnessed to transport and erect the obelisks. Axum is linked to the legend of the enchanting queen of Sheba, who, having met King Solomon in Jerusalem, on her return gave birth to Menelik I, who was the founding father of the family known as King of Kings. Legend also has it that the original Ark of the Covenant is housed in a chapel near the church of Saint Mary of Sion. The Ark is believed to have been brought back by Menelik I on his return from Jerusalem. The park has a number of pre-Christian obelisks (made of solid granite from the surrounding hills) some of which are thought to be more than 3000 years old. The tallest, standing, obelisk rises to a height of over 75 feet and is exquisitely carved to represent a nine-story building, similar in appearance to the tower-houses of South Arabia. The tallest fallen stelae, which according to local legend crashed to the ground in 850 AD, was 110 feet high and represented a tall and slender 13-storey building. With its rows of windows and doors complete with an imaginary knocker and lock, this symbolic house is thought to have been a dwelling of the spirits of the dead. Alternatively, it may have marked the tomb of an important monarch. The site contains the remains of what was once a massive palace with finely mortared stonewalls, deep foundations and its own impressive drainage system. It is believed to be the oldest building in Axum. To date, over 50 chambers have been excavated. The floor of a large throne-room has been discovered intact and, although the upper floors and roof have long since fallen in, it is not difficult to imagine the rulers of ancient Axum holding court there. The church was built by Emperor Fasilidas in 1665, and the podium on which the church is standing, may well belong to the original church erected by King Ezana or King Kaleb in the 4th or 6th centuries after the adoption of Christianity. Unfortunately, the original church was destroyed during the Muslim Christian war. Legend has it that the current church is the sanctuary of the Ark of the Covenant. The Ark, according to Ethiopian belief, has remained in Axum ever since. It is kept in a special chapel annexed to the church of St. Mary of Sion. The Ark is in the care of an old and especially holy guardian monk, and according to tradition, he is the only man who is allowed to gaze upon it. Within a tin-roofed hut in this central park is a famous 4th century AD trilingual inscriptions' stone of King Ezana. It is written in Sabaean, Ge'ez and Greek and records the honorary titles and military victories of the king over his enemies. Time permitting; you will also visit the Axum Museum before returning to your hotel. The museum houses exhibits on ancient pottery and glass, Roman amphorae, bronze jewellery and clay figurines. Day 6 - Fly to Gondar. Sightseeing. You transfer to the airport for your short flight to Gondar. It was here in 1636 that Emperor Fasiladas made Gondar his capital. Often described as Africa's Camelot, it is the town's castles and one of its remarkable churches that inspire. Your guide will take you to visit Debre Berhan Selassie Church which has some wonderful frescoes illustrating the story of Christ, and a unique ceiling covered with the faces of inscrutable cherubs. The church is surrounded by a wall with 12 towers representing the 12 apostles. Your next stop will be the Royal Enclosure - a 70,000 square metre site housing castles from Emperor Fasiladas' reign in the 17th century. Lastly, you will visit Fasiladas' bath which was used for Baptism ceremonies. Tree roots have consumed some of the stone wall surrounding the bath which gives it an intriguing and engaging appearance. Day 7 - Drive to Simien Mountains National Park, 3,260m/10,696ft - 4 hours. An early start today for your drive into the Simien Mountains National Park. En route to Debark you pass the villages of Ambagiyorgis (means hill of St. George) and Davat. The people from this area grow lentils, fenugreek, wheat, oat, barley, beans and tef (the staple Ethiopian cereal). The predominant tribes here are Amhara - both Christians and Muslims, although the former are the dominant population. The scenery is an impressive and vast expanse of distant mountains and escarpments. You pass many eucalyptus trees which are used for building houses and for firewood, and you will see many local traders in traditional, billowing robes going from place to place on foot or horseback - always with their trusty dula (wooden staff). The Simien Mountains National Park Headquarters is at Debark, 3,000m/9,850ft, and here you will need to register which takes about 5-10 minutes. The drive from Gondar to Debark takes around 2½ hours and it is likely you will stop here for tea/coffee. You continue to drive into the National Park and shortly after the entrance to the Park you are likely to have your first, memorable encounter with a troop of gelada baboons. Due to the red patch on their chests (the subtle colours of which indicate their sexual condition at a given time), they are often called Bleeding Heart Baboons. These fascinating creatures, endemic to Ethiopia, are wonderful to observe. They are not too scared of humans, so you can get quite close, and watch them dig frantically for roots, groom their mates, or just play. An hour or so of driving from Debark brings you to the Simien Mountains Lodge, 3,260m/10,696ft where you will be spending the night at Bwait Ras. There may be an opportunity to have a short, late afternoon stroll before dinner at the Lodge. Day 8 - Walk to Sankaber, 3,250m/10,663ft - 3-4 hours. Today you will walk up to Sankaber (3-4 hours) which involves walking along the escarpment, with commanding views of the landscape. On the way, keep an eye open for the rare and the graceful raptor that is considered lord of the high plateau, the Lammergeyer, soaring in search of food. You stand a good chance of spotting the endemic thick-billed ravens (usually very interested in your lunch! ), crows, kestrels and Auger buzzards. Along the trail you will experience the enormous Afro Montane flora including the everlasting flower, Saint John's Wort or hypericum revoltum, helicracium and archemila and what may surprise is that familiar species known to be shrubs in Europe grow to towering trees here. Sankaber is situated at 3,250m/10,663ft and today's short walk is a gentle undulating stroll and an ideal introduction to the Simien Mountains. After your walk to Sankaber, a vehicle will take you back to your lodge. Day 9 - Drive to Chenek, 3,600m/11,812 ft. Walk towards Bwahit. Just above Chenek there is a good spot for viewing Walia Ibex. You continue ascending until another good viewpoint, approx. 280m/900ft from Chenek which provides superb views of Silki 4,420m/14,901ft, and the village of Lori below. You could continue to Bwahit 4,200m/13,779ft, which rewards you with a good viewpoint on the eastern escarpment although you will doubtless be feeling the altitude here and might not wish to walk so far. From Bwahit you can see Bwahit Peak, 4,430m/14,534ft, above you, and below you to the east you can see the village of Chiro Leba. You are likely to see plenty of activity today with local people wandering up and down the trail, sometimes with donkeys bearing loads to trade, sometimes herding their goats, and you will probably also see ox and horses ploughing the land. Day 10 - Drive to Gondar. Today, you drive back to Gondar which will take about two to two and a half hours. You will arrive in Gondar late in the afternoon. After dinner at the hotel, if you are looking for a lively bar down town to celebrate the successful completion of your Simien Mountains' adventure, the Golden Gate is packed with young, trendy locals and is a great place to people watch with a couple of beers. Day 11 - Drive to Bahir Dar. Visit Blue Nile Falls. Today you drive from Gondar to Bahir Dar (a name which means 'by the side of the sea' in Amharic). This drive is about 180 kms and takes some 3 hours. From Gondar you drive through the mountains with good views from Guzara, Castle of the Emperor and of the isolated rock tower known as the Devil's Nose. Your route takes you through the beautiful hill landscapes of Tara Gedam and down to the small town of Addis Zemen, some 100 kms from Bahir Dar, and round to the east of Lake Tana, crossing the Fogera Plain, a good spot for aquatic birds. After meeting your guide you will be driven to the Blue Nile Falls - known locally as Tisisat - which means "Smoking Water." The falls are 328 feet wide and the water plunges some 150 feet, giving rise to picturesque streams, clouds and rainbows. If time permits, you will drive up hill to Bezawit where you can enjoy the commanding view of Lake Tana and its island monasteries and the Blue Nile River leaving Lake Tana. You then move onto the colourful market of Bahar Dar. Day 12 - Cruise on Lake Tana. Today, you have an early start for your cruise over Lake Tana which is the largest lake in Ethiopia with an area of 3600km2. There are 37 islands on the lake and 30 of them have churches and monasteries of considerable historical and cultural interest. One of the monasteries goes back to the pre Christian era, but most of them date back to the 13th century. The cruise takes the whole day with lunch onboard. You glide towards Gorgora, while visiting Ura-Kidanemihret, Azua Mariam and Narga Selassie. You will also visit the beautiful water separation, which clearly shows the Blue Nile River leaving its mother source, Lake Tana, at the departure point. The Nile and Tana have typically different colours. Day 13 - Fly to Addis Ababa. Afternoon sightseeing. You will be taken to the airport for your flight to Addis. On arrival you will be met and taken to your hotel. This afternoon, you will have time to complete any sightseeing you didn't manage to fit in on your first visit. You may be taken to see the Holy Trinity Cathedral - the final resting place of Emperor Haile Selassie and his Empress. Outside the cathedral is the memorial to the ministers killed by the Derg regime - photography here is forbidden as the PM's compound is behind the memorial. Your guide may also suggest a drive through the Mercato - one of the largest open air markets in Africa. It's considered a haven for pick-pockets, so it's wise just to drive through. It's a lively and colourful spectacle where just about everything you can think of is on sale. For your last night, you will be taken to a local restaurant for a farewell dinner. Day 14 - Group transfer to the airport. Fly back to London. Today you will be transferred to the airport for your flight back to the UK, you will arrive home the same day. We would just like to say what an adventure we had in Ethiopia, the trip was everything we could have asked for and more. The itinerary was superb and the days we spent in the Simiens was an ideal break between the historical sites. Ethiopia is a fantastic countryÉ Once again, many thanks for all your help in planning our holiday and we hope to travel with Mountain Kingdoms again in the future. Everything is so well organised. I felt cared for and safe. The itinerary was interesting and varied; the accommodation good. Your staff are all god. You bend over backwards to make a trip enjoyable. The whole trip is so well organised from start to end. I have full confidence using Mountain Kingdoms for any trips. They are very helpful and go out of their way to answer any queries or concerns. I have never encountered any difficulties.